Attend the Mardi Gras Annual Masquerade Ball and help get this soiree back on track by trading clues with your guests, gathering information, and solving the crime before the masked menace gets away! Party attire, masks, beads, and boas are what to wear to this fun night of disguises and murder. Get ready for a fabulous evening of mystery, intrigue, and murder. 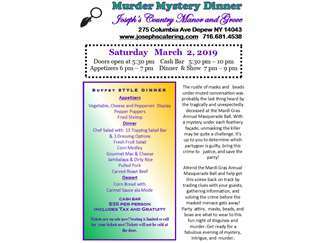 Joseph’s has hired The Murder Mystery Co. to provide the entertainment for this event! The Murder Mystery Co., founded in 2002, Performs in over 40 venues in 20 states, each putting on multiple shows every month. Each state has its own director and a cast of local actors—25 directors and more than 1,000 actors nationwide… And they are all kept very busy! Not only do they perform dozens of shows every month at some amazing host venues, but they do hundreds of private shows, as well. Added together, they perform more than 3,500 shows for over 300,000 guests every year! They have performed for Amway, McDonalds, Make A Wish, Coca Cola, GE, Kellogg and many others! We hope that you can join us as they perform at our place on February 9th for a “Married to the Mob” Murder Mystery Dinner and March 2nd with a specially created Mardi Gras Murder Mystery Dinner just for us! Call today for tickets 681.4538.